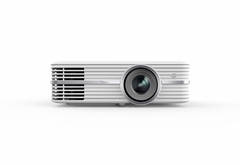 Transform your living room into a high-quality home cinema with the affordable Optoma UHD50 4K UHD home theater projector. Its high 4K UHD resolution, 2,400 lumens of brightness, wide color gamut support and up to 500,000:1 contrast ratio combined with HDR compatibility delivers amazing detail, clarity and vibrant colors that bring your favorite Hollywood blockbusters and games to life. The latest Texas Instruments 4K UHD DLP chipset with high-performance DMD and XPR video processing technology forms the heart of the Optoma UHD50 and meets the CTA�s definition of 4K Ultra HD. This innovative fast-switching technology displays 8.3-million simultaneous distinct pixels at screen sizes up to 140-inches for immersive home cinematic experiences. A pair of HDMI 2.0 inputs with HDCP 2.2 support ensures the Optoma UHD50 works with the latest 4K UHD video playback devices and game consoles with HDR at 60 Hz refresh rates for unmatched eyecandy and smoothness. A 1.3x optical zoom and 15% vertical lens shift provide installation flexibility.